Ultimate comfort, even when you're in the ultimate contest. 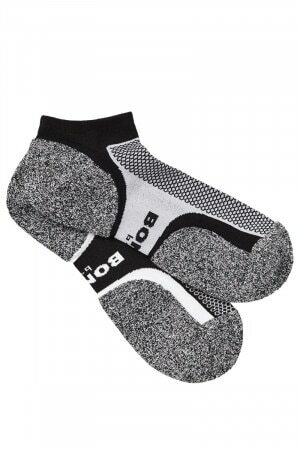 These specially designed sport socks feature padded cushions for extra comfort and shock absorption, as well as a mesh open knit for breathability when things get hot. Mens Ultimate Comfort Low Cut Sock 2 Pack is rated 4.4 out of 5 by 9. Rated 4 out of 5 by Owen from Pretty comfortable. They are comfortable and release sweat pretty well. Would rate 8.5/10. Rated 3 out of 5 by James 62 from Socks ok but 1 too big Received in good time. But every time I buy 2 x 2 pack of these socks at least 1 individual sock is too big. Heel comes up back of foot. Wearable but annoying. Why cant all socks be same size?? Rated 4 out of 5 by Pablo from These are pretty good, fit well and after washing have not shrunk.